For other uses, see Communist Party of Nepal. International Meeting of Communist and Workers' Parties. The Communist Party of Nepal (Unified Marxist–Leninist), also known as CPN–UML and CPN (UML), is one of the two largest political parties and the largest communist party in Nepal. It was created on January 6, 1991 through the unification of the Communist Party of Nepal (Marxist) and the Communist Party of Nepal (Marxist–Leninist). CPN (UML) was a product of the Jana Andolan (People's Movement) uprising where communists, together with the Nepali Congress, played a major role to restore democracy in Nepal. In the most recent elections, the CPN–UML emerged as the second largest party in the Constituent Assembly winning 175 out of 575 seats. The fifth party congress (and the first one after the unification, the four first being of the original Communist Party of Nepal) was held in Kathmandu in January 1993. People's Multiparty Democracy was adopted as the party programme. Madan Bhandari was elected General Secretary and Man Mohan Adhikari was elected Chairman. Later the same year Bhandari died in a vehicle incident at Dashdhunga in Chitwan. After Bhandari's death, Madhav Kumar Nepal was elected General Secretary, and he remained in post until 2008. In December 1994, CPN (UML) formed a minority government, which lasted nine months. Man Mohan Adhikari was elected Prime Minister and Madhav Kumar Nepal became Minister of Foreign Affairs. In 1997, CPN (UML) participated in a non-Nepali Congress government, with a faction of the Rashtriya Prajatantra Party and the Nepal Sadbhavana Party, and held the Deputy Prime Ministership. In March 1998, CPN (UML) suffered a severe split over the Mahakali Treaty with India. Those opposing the treaty broke away and formed Communist Party of Nepal (Marxist–Leninist) led by Bam Dev Gautam. The vertical split caused much harm to the party; in the 1999 parliamentary election, CPN (UML) merely got 31.61% of the votes whereas the rival faction only secured 5% of total votes. On February 15, 2002, CPN (UML) and CPN (ML) were reunited. Following the merger, CPN (ML) leaders Sahana Pradhan, Bam Dev Gautam and Radha Krishna Mainali were nominated to the standing committee of CPN (UML). Siddhilal Singh, Ashok Rai, Trilochan Dhakal, Kiran Gurung, Gopal Sakya, Kamal Chaulagain, Rajendra Shrestha and Sitananda Raya were appointed full members of the central committee. Kamal Koirala, Hemraj Rai and Yogendra Shas were appointed alternative central committee members. The 7th general convention of CPN (UML) was held in Janakpur, February 1 – 6, 2003. The convention decided to abolish the post of party chair, a post vacant after the death of Manmohan Adhikari. Madhav Kumar Nepal was re-elected unopposed as General Secretary of the party. The convention elected a Central Committee consisting of Ashok Rai, Jhala Nath Khanal, Bharat Mohan Adhikari, Sahana Pradhan, Madhav Kumar Nepal, Subash Nemwang, Modnath Prashrit, Krishna Gopal Shrestha, Amrit Kumar Bohara, Pradeep Nepal, Bam Dev Gautam, Yuvraj Gyawali, Rajendra Pandey, Bidhya Devi Bhandari, Astha Laxmi Shakya, Keshab Prasad Badal, KP Oli, Shankar Pokhrel, Radha Krishna Mainali, Pradeep Gyawali, Ishwor Pokhrel, Kashinath Adhikari, Bishnu Poudel, Siddhi Lal Singh, Mukund Neupane, Shanta Manavi, Surendra Pandey, Rajendra Shrestha, Kiran Gurung, Yuv Raj Karki and Raghu Pant, Suresh Karki, Bhim Rawal, Dhanendra Basnet, Hem Raj Rai, Bishnu Rimal, Trilochan Dhakal, Bhim Acharya, Kedar Neupane, Urbadutta Pant, Govinda Prasad Koirala,and Gopal Shakya. 12 alternate members of the Central Committee were also elected: Chabbi Lal Biswokarma, Tul Bahadur Gurung, Urmila Aryal, Rakam Chemjong, Pashupati Chaulagain, Gokarna Bista, Prakash Jwala, Mahendra Pandey, Naresh Kharel, Ratneswore Goit, Puruswottam Poudel and Ramji Sharma. When King Gyanendra in 2003 dissolved parliament and sacked Prime Minister Sher Bahadur Deuba, CPN (UML) took a leading part in the formation of the 5-parties protest movement. However, once Deuba had been reinstalled as Prime Minister, CPN (UML) joined the provisional government. This government was dissolved by Gyanendra in 19th Magh of the same year. In 2006, CPN (UML) was a major part of the Seven Party Alliance and the Loktantra Andolan. Madan Bhandari proposed a new theory based on the then International Historical State and the state of national class struggle. The relevance of the theory is the leading principle of the Nepalese Revolution up to this time. PMD is of the view that the Nepalese people cannot gain success in this global world without gaining the political and economic power needed. The only means to have a successful state is through the maintenance of the People's vote not from Armed Struggle. All the people must, therefore, be made aware of this and be united to cast vote for Communist parties. The Communist parties along with their leaders and activists should be popular among people. The new Nepalese state cannot be a People's Democracy without the popular vote. 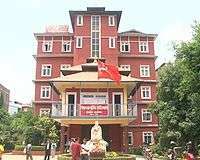 CPN (UML) advocates a moderate leftist attitude. It played a major role in bringing Maoists to the negotiating table. However, the party has not been able to maintain a firm stance on issues, particularly during drafting the interim constitution, which showed a dual nature of the leadership. For the April 2008 Constituent Assembly election, the party rejected the proposal of electoral alliance with the Communist Party of Nepal (Maoist), citing its own popularity among people, and it decided to compete in all constituencies. It turned out to be a grave mistake, as the CPN (UML) failed to secure a single place out of 10 in the Kathmandu district, once considered to be its lal-killa (लाल किल्ला), or stronghold region. The biggest shock to the party was that General Secretary Madhav Kumar Nepal was defeated in an election by Jhakku Prasad Subedi of the CPN (M), who had been viewed as having very little popularity. Following his defeat, Madhav Kumar Nepal submitted his resignation from the post of General Secretary of the party, the post he held for 15 years. The CPN (UML) won a total of 103 seats in the election (out of 575 elected seats), placing third behind the CPN (M) and the Nepali Congress. The party left the government after the election, citing the "clear will of the people" expressed through the election as the reason. Following the resignation of M. K. Nepal, the post of General Secretary of the CPN (UML) was filled by Jhala Nath Khanal. On February 2009, Jhala Nath Khanal has been elected to the Chairman of CPN (UML) by the eighth General Convention of the party organised in Butwal. Ishwor Pokhrel was elected to the General Secretary. In early May 2009 the UML joined several parties in leaving the Maoist-led coalition government in response to the sacking of Army Chief of Staff Rookmangud Katawal. Following the resulting dissolution of the coalition, the UML now leads its successor. On February 3, 2011, because of support by the UCPN Maoists, who are the third biggest party in the legislature today, Jhala Nath Khanal was elected Prime Minister of Nepal, securing a vote of 368 out of 601 in the Constituent Assembly. KP Oli became the chairperson of CPN UML defeating Madav Kumar Nepal in the election held in July 2014. 1 2 "The Himalayan Times: Oli elected UML chairman mixed results in other posts – Detail News: Nepal News Portal". The Himalayan Times. July 15, 2014. Retrieved July 15, 2014. ↑ "News In Nepal: Fast, Full & Factual, Political Affairs, Business & Economy, Social Affairs, Lifestyle, Sports, Opinion, Interview, International, The Week News In English In Nepal". Myrepublica.Com. Retrieved August 18, 2013. ↑ "South Asia | Nepal communists quit in protest". BBC News. May 3, 2009. Retrieved August 18, 2013. ↑ "New coalition of forces emerges in Nepal's revolution". Pslweb.org. Archived from the original on August 20, 2013. Retrieved August 18, 2013. 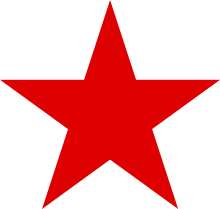 Wikimedia Commons has media related to Communist Party of Nepal (Unified Marxist–Leninist).